Last October, when I was ordering the Spinach Pie, I spotted an almost completely hidden promo item on a small paper cutout at the very far side of the menu. They were selling Bubble Tea, and more interestingly, Bubble Coffee. I know that Bubble Tea's have popped up at McCafe's here and there, but since I usually try to review "regular" McDonald's items, and Bubble Coffee was a new one for me I went for it. I was lucky enough to catch Bubble Tea on the regular menu in China a couple years ago, so it was an easy decision. The woman who took my order actually didn't understand what a Bubble Coffee was, and it took a manager to get it keyed into the system. I paid the bill, received the food I had ordered, but no one seemed to remember the Bubble Coffee. After waiting for another couple minutes (and the food quickly getting cold) I had to flag down the manager, who after running around for a bit and yelling at a couple employees in Thai, told me that I would need to head to the back of the store to the dessert kiosk and get it from there. I dropped the food off at the table with The Wife, and I headed into the rugby scrum that was the dessert kiosk. There were at least 10 people in queue, and another 5 people waiting for their order, with a single, miserable-looking high-school student manning the counter. I had to elbow my way through a couple Mainland Chinese tourists, and try and to explain with my receipt that I needed to get the Bubble Coffee from her. She wouldn't even acknowledge me for a minute or two, and when I finally did get her attention, she just pointed back to the main counter and went back to serving the other customers. I had to go back and grab the manager who helped me to explain the situation. My wife watched me cross the restaurant back and forth and just laughed at me...This was easily the longest it's ever taken to get a McDonald's item, and I thought to myself that it had better be good! 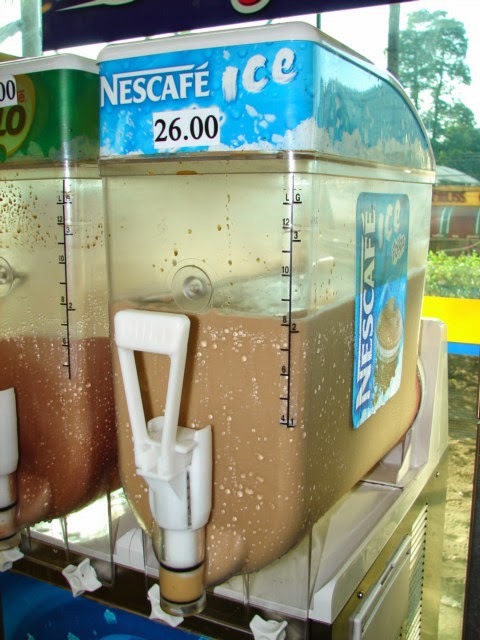 For those of you which don't know what Nescafe Ice is, you cannot call this coffee. This is more sugar than anything else. I bought a can on my first trip to Malaysia, and I saw that this stuff has more sugar than can of Coke...and she added sugar to it! The Bubbles are essentially boiled in syrup as well, so I didn't even want to image how much sugar this rather large cup had. When I finally brought it to the table, I told my wife she shouldn't drink more than a sip. We both drink our coffee strong and black, and although I can enjoy coffee with milk, I knew neither of us could handle that much sugar in it. It happened to be just as terrible as I expected. The "coffee" tasted like they had a single serving of instant coffee in the entire dispenser, and even the bubbles were hard and stale. Even though it took nearly 15 minutes to hit our table, it nearly all went into the trash.